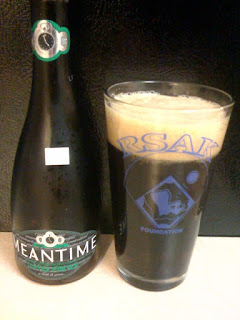 I found this beer from Meantime Brewing Company back during the Marcello's clearance sale. I'd never heard of the beer or the brewery before, but trying new beers is what this is all about! It comes in an odd little champagne-esque 11.2 oz. bottle that I poured into a pint glass... I've never been a huge coffee-beer guy, but here goes. That's no reason not to give this English beer a try. The beer poured a dark red color, with a two-finger or so creamy off-white head. It didn't dissipate quick, some lacing there... looks inviting. It smells like coffee, there's no mistaking that. The rich coffee odor dominates the nose, the only other thing I pick up is hints of chocolate, not surprising at all for a porter. If you like the smell of a coffee shop, you'd probably love the smell of this beer. The taste is strong bitter coffee at first, and that dominates the palate. Even get some rough coffee bean aftertaste at the end, all with a chocolate feel to it. Like drinking chocolate covered coffee beans is the best way to describe it. Very nice, good mouthfeel, a little bitter aftertaste, but the medium body goes down pretty smooth. This offering is not for a light beer drinker, and probably not a good gateway to the world of craft beers, but for one of my first experiences with coffee beers, I enjoyed it a good bit. I can't really comment on the value of this one... I got it on clearance sale and haven't seen them anywhere else in town that I remember. If you do find some, it's certainly worth a try! And we're back with a new address!